Since my last review this pub has gone down hill. The beer doesn't taste right and often has an slightly acrid taste to it (pipes clean?). Beer choice not so varied and always has Greene King beers ....then I noticed the GK plaque outside the pub on a side wall. A rather sterile alternative to the Basketmakers, which is stationed directly opposite. 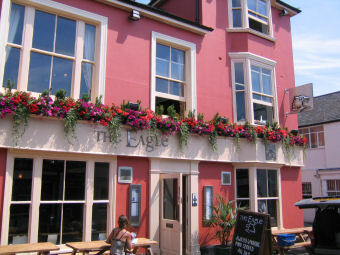 Punters spill out of both on to the road during the summer months – to the chagrin of one local resident, who’s put up a robustly worded notice to steer well clear of his property – so there’s a boho vibe around these parts but there are far superior options to the Eagle, which is just a bit run-of-the-mill. A popular street corner pub, we had not intended to visit here but as there was no room at The Basketmakers over the road, this seemed the next best alternative. It has a rustic feel to it, and was fairly full on a recent Saturday lunchtime. It’s a single room pub with old boards on the floor, some pine wood panelling on the lower part of the walls and maroon paintwork up above, including the ceiling, although there was also some patterned wallpaper at the rear. There was an old cast iron fire-place to one side, although this was not in use which would have been a nice touch on a recent freezing cold visit. A plasma was mounted up on one wall, although this was not in use either and the furniture was mostly chunky farmhouse style wooden tables. A wood clad bar counter was off to the right, and there was further pine cladding on the wall behind this. Several large speakers were dotted around which hinted at the fact that it may be considerably nosier at times than the lunchtime we visited. One wall had a number of pieces of artwork displayed which appeared to be for sale. The food seemed popular with a number of punters eating, although I did not inspect the menu. As with many pubs, this suffered from the problem of one guy behind the bar who was both taking food orders and trying to serve drinks which meant service was somewhat slow. To be fair to him, he was doing his best and apologised when he got to me, but it was getting to the point where I was thinking of walking out. Another barmaid did subsequently turn up, but she seemed more of a hindrance than a help since the first guy had to show her how to work the till. Beers on tap were Greene King Yardbird, Dark Star Hophead and Abbot Ale. There was a fourth pump for Trelawney but this had run out. Ciders were Aspall’s Suffolk and Strongbow. Prices seemed very expensive at £10.40 for two pints and two packets of crisps.